In his photographs, Ole Brodersen works with elements he knows well: wind, water, sails, and ocean light. The son of a sail-maker and grandson of a sailor, Brodersen grew up as a 12th-generation inhabitant of a sparsely populated island in Norway; without cars, even rowing himself to school. The large-format photographs in his series Trespassing are interventions in the natural landscape near Brodersen’s home. In some photographs, he set aloft boat sails, held up by kites, and photographed the action of the wind, using long exposures. In others he launched small rafts with sparklers or LED lights on them, and recorded the long wavy lines as waves or current moved the rafts over time. Brodersen’s photographs are not the usual “decisive moments” in time, but rather are patterns of movement and natural phenomena that are normally unseen, recorded using varying durations of exposure. 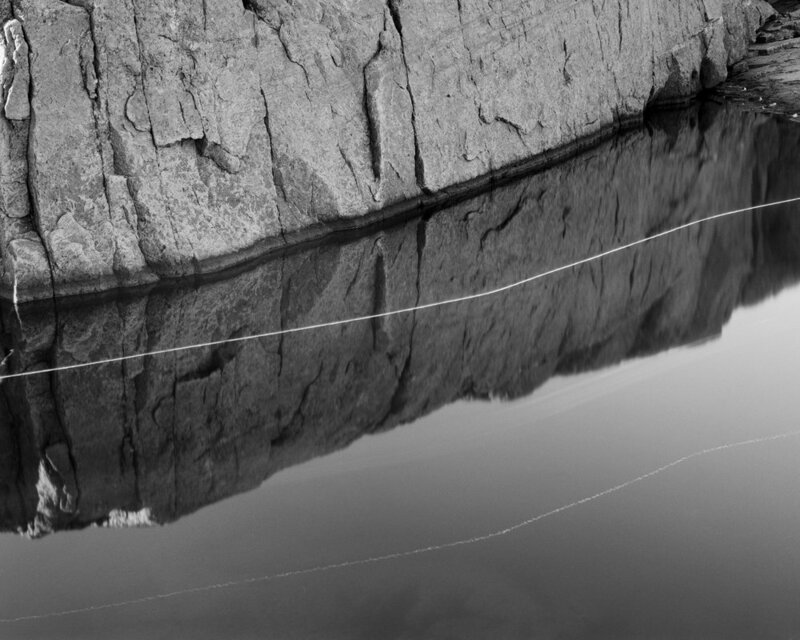 During an artist-talk at the Dedee Shattuck Gallery, Brodersen spoke of trying to express with his photographs the feeling of being in the landscape, the moving natural elements of wind, water and waves. 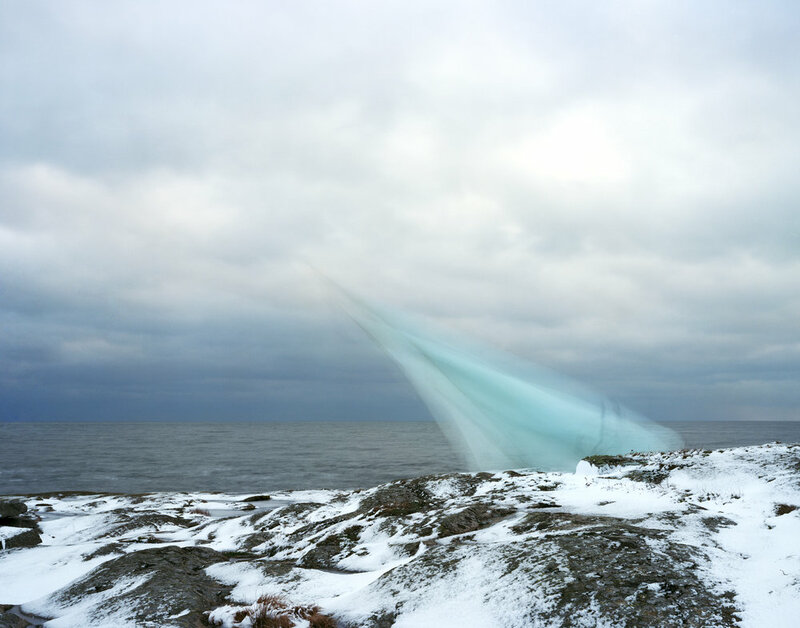 In some of the photographs his interventions are intelligible, such as String, cloth and kite #04, where, although blurred, you can make out the general shape of a fluttering boat sail against the seascape. Photographs like this one do give a feeling of being in the remote, wind-whipped, Norwegian landscape. However, I found myself drawn to the more mysterious images that transcend interpretation. String, cloth and kite #02 is a similar image, of a fluttering sailcloth against the snowy ocean’s edge, but this time the exposure is so long that the sail becomes an abstract white apparition. 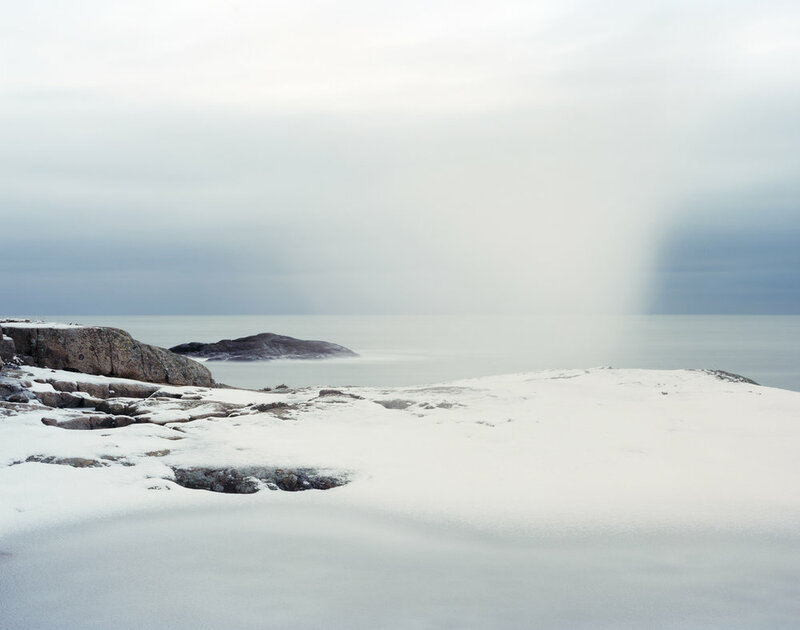 Merging ambiguously with the clouds and snow, the blurred sail could perhaps be a localized snow squall, or even a mistake in film processing. Regardless, the result is beautiful—the intervention has truly become integrated into the landscape. 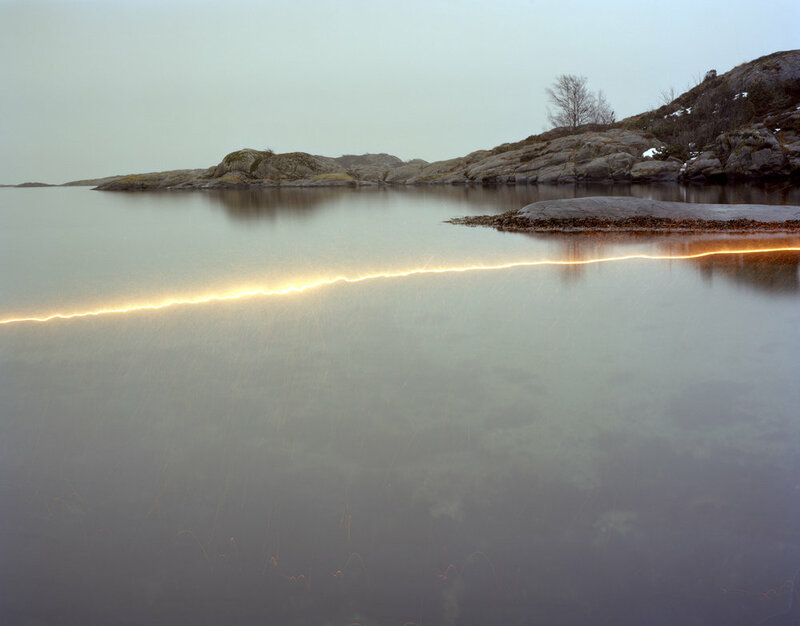 Brodersen’s long-exposure images made using floating light sources are also intriguing. While relatively straightforward, the images reward closer inspection with interesting details. Plexiglass, wood, sparkler and string #05 is a wavy trail of light left by a small raft and light source moving along with the water currents. Looking closer, one realizes that the light source is a sparkler and that the sparks themselves are actually bouncing off the water. Wood and sparkler #03 is curious as well. It’s a double light-trail across the water—a sparkler trail as well as its reflection. The interesting detail is that the sparkler has charted a smooth course, whereas the light trail of its reflection is jagged from the water ripples. Brodersen shoots with a large-format view camera, exposing single sheets of film in either color or black and white. He prints the mural-size black and white photographs by hand, in his home darkroom (located in the same building as his father’s sail-making workshop). Bringing to mind the early pioneers of landscape photography who carried wet-plate camera and darkroom equipment by mule into the landscape, Brodersen discussed the technical challenges of transporting cumbersome photographic equipment by boat, and making exposures in wet and cold landscapes. He noted that some of his images show dust on the film and other imperfections, which, rather than trying to “correct,” he has accepted as one more way that the photographs express the conditions of the landscape in which he works. Joel Howe is an architectural and fine-art photographer based in Cambridge, MA. He also edits and maintains the Call for Entries feature of the PRC website.